Recently, I came across an interesting article in advisor.ca concerning RRSPs, and when it might be time to avoid contributing in them further. Below are some of the reasons why you may reconsider continuing to contribute to an RRSP. When on the CUSP of Retirement (5 to 10 years). Suppose you have dip in income. 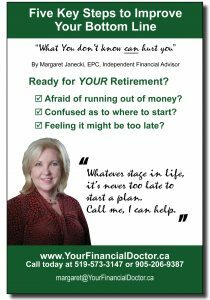 If your income will be lower now than during retirement, and your retirement income will cause an OAS clawback, you should consider taking money out of the RRSP now, while your income is low, and investing it in a TFSA. Retirement planning means looking at the RRSP contribution strategy for BOTH spouses. If one spouse no longer works, and his or her spouse remains in the workforce, she should be able to remove money from the RRSP virtually tax free. Draining money from her RRSP and transferring it to a TFSA will make less of a burden on tax payments on RRIF withdrawals later. Wealthy investors should consider non-registered accounts instead of RRSPs to build tax-efficient portfolios. Money coming out of RRSPs is taxed at the client’s top marginal rate. But this would not happen with investments made in a TFSA. Of course, everyone’s situation is different, so it is always wise to speak with a Financial Advisor first, in order to review how best to allocate your hard earn savings. Contact me today about your specific set of circumstances. Let’s get you on the right track toward saving for YOUR FUTURE, whether that be in RRSPs or TFSAs. Call me… I can help! ← Women Face a Double Financial Burden When They Divorce Later in Life.